Mind Games is the first book I have read by author Keirsten White. I know that she has a pretty big fan base because of her Paranormalcy series, so I had pretty big expectations going into this book and I wasn't disappointed. 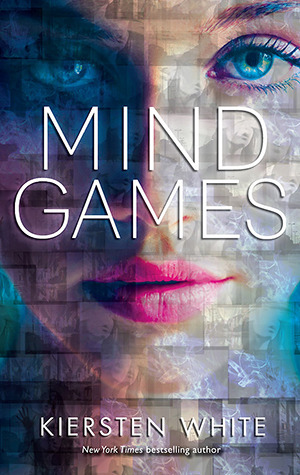 Mind Games is exactly what the title would suggest- a book that totally messes with your head. This is not a fluffy beach read. This is a book that requires your attention and focus. The narration of the book bounces back and forth between two sisters, Fia and Annie. Annie is a Seer, who mainly sees the future of her sister Fia. Fia is the brute strength of the school and is required to do many horrific things in order to keep her sister Annie safe. Fia is a very broken character, and it is most obvious in her narration. Fia's inner dialogue is broken, jumbled, and almost sounds like someone who is crazy. She lives on pure instinct and has an incredible amount of rage that she is hiding. Annie, on the other hand, seems incredibly naive and innocent (although all is not what it seems). The characters are interesting, the situation is interesting, and there is a great deal of action to keep the reader engaged in the story- but the story really shines in the relationship between the two sisters. Responsibility and the desire to "take care of each other" is really what is at the heart of the relationship between these two. Each is doing what they can to take care of each other- and sometimes in very ugly ways. Fia is volatile, impulsive, and makes rash and sometimes stupid decisions. Annie is both blind visually and blind to the world in many ways (or perhaps is choosing to be blind). With flip flops between years throughout their time with the school, the reader gets an entire picture of who Annie and Fia are and how they became that way. Mind Games is a fast-paced, entertaining story. Everything is fast about it: the length of the story, the dialogue, the inner dialogue, and the action. It was smart and fierce read. I am a little surprised that this is going to be a series, but am excited to read where the author will take these characters next. I really loved the fast pace of this book although I wish we had gotten some more background and answers about the school and what they wanted Fia to do. Hopefully the second book will give me them.